Metal maniacs, rejoice! I am proud to present to you: STEEL ENGRAVED; signed via ROAR - Rock Of Angels Records, hailing from the glory of Germany - performing Heavy/Power Metal on their 3rd self-titled album (released January 25th, 2018). Since formation in 2007; the sextet in question have a Demo, and 3 albums in their discography so far. 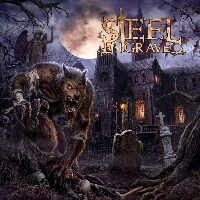 I am introduced to their 3rd self-titled album entitled: “Steel Engraved”; 13 tracks ranging at around 56:29, STEEL ENGRAVED arrange an intricately designed formula of hard-hitting Heavy/Power Metal amalgamations. “Where Shadows Remains” begins the record; demonstrating charging barrages of boistrously concrete chugs, generating galloping mayhem of meticulously stampeding results. Hardened battle hymns of harmonic haste; a grandiose manifestation of prodegiously ponderous rhythms that shine with steel, shield and sword rebellion. Conveying gritty melodies that relentlessly stomp with progressively technical ramifications, songwriting that spells doom while forging flamboyantly excelling finesse. Consisting of Marco Schober on vocals; the frontman delivers a consistently composed flair of profusely robust pipes, proficiently high-pitched with a rawly organic substance and a hint of gnarly raspiness. “Generation Headless” injects infectiously fluid grooves and catchy captivation; distributing dominately diligent aesthetics, adrenaline-fuelled energy - coverged with constructively distinguished instrumenation in which is creatively diverse including electronical keyboard effects from Mäx Lindner and complex dexterity from guitar duo Andi Straehler & Tomas Kuchta. Songs like “The Oppressed Will Fly”; “Slave To Yourself” & “Nightwarriors” integrates experimental contrast, establishing on blistering riffs and solos while rushing with thunderous remedies of solid skill. Implementing elements with conceptual detail and a host of uniquely versatile ultilities; powerhouse virtuoso Daniel Steckel on the audible bass & Jaroslav Rod on the battering drums, hammer their weapons with smashing weight. “Rebellion” resembles this well, slamming with seamlessly sonic speed as well as showcasing rapidly swift nimbleness with razor-sharp rhythms that supply a slab of salubrious screams of vengeance. Frolicking with fabricated vehemence, while pounding with persistently primitive savagery. “Searching For Regret” systematically subjugates hybrid efficaciousness; embellishing on hostile deadliness culminated with fierce velocity, roaring with variety and intensely immense inventivity. Portraying rambunctious stability, while engaging on elegantly exquisite entertainment. “One By One” examines anthemic ritualism; united by hate, love and brotherhood, conjuring a divine frenzy of instrumental hooks and musical qualities that quintessentially provide excelling executions of amplified attributes and adroit coherence. “Heat” is a fast one; exhibiting crunchy firepower, expertise and a borderline foundation of meaty professionalism – unleashing unprecedented meltdowns that splendidly juxtapose with operatic singing and majestically electronic keyboard segments manage to keep things interesting and memorably original. “Your Inner Self” brings an arsenal of atmospheric ambience, combined with frantic pace, balanced with double bass drives – engineered characteristics in which delight in ambition and motivation…enlightening and fulfilling stuff. “Close Your Eyes” overall concludes the main version with its finalized ensemble of orchestral whirlwinds and stimulating strength; until the bonus tracks: “We Will Follow” & “All That Lies Below” extends this addition with more harvests of soundscapes that rivet with skill. Bottom line; I discovered a band who certainly outdone themselves here, and “Steel Engraved” is definitely one to listen to - worth the time!